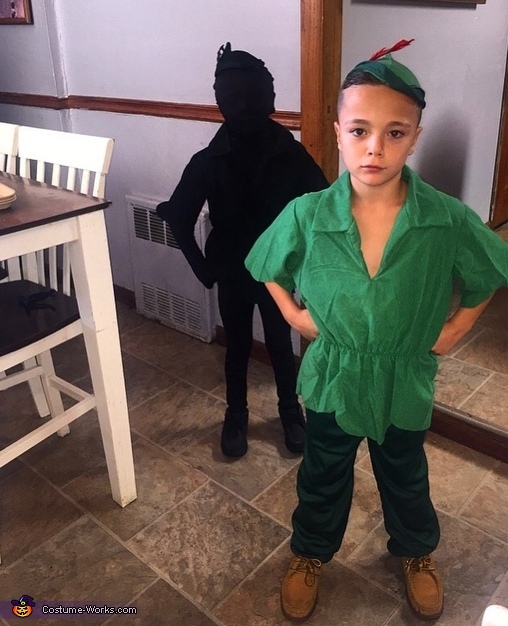 My twin sons Carmine and Devin, both aged 9 went as Peter Pan and Peter Pans shadow. The idea came after a difficult school test my son rested his head on me and said "I don't want to grow up." The famous line from the movie inspired the idea which was very suitable for twins being that they are both the same height and weight! The shadow is not a costume available in stores or online so we ordered two Pan costumes. We then used black fabric paint (4 cans needed) to spray the costume. We needed a few sessions of spraying and drying in the duration of a month to cover the costume. We also used a black morph suit for his face, arms and legs. Hope you enjoy!